You can get your daily breaking news updates instantly via Twitter by following @whthome, join me on www.facebook.com/WolfgangHThome where the articles also ‘cross load’ or read the daily postings on my blog via www.wolfganghthome.wordpress.com which you can also ‘follow’ to get immediate notification when a new article is posted. UNITED WE FLY, DIVIDED WE DON’T? The recently held annual general meeting of AFRAA in Johannesburg sprang a few surprises on delegates and aviation pundits, when none other than Kenya Airways’ CEO Dr. Titus Naikuni had the room go so shtumm that a falling leaf could have been heard, as he floated the idea of the key sub Saharan airlines merging to weather the onslaught of the newly emerged Gulf giants as well as the legacy carriers from Europe, all keenly eyeing the continent’s traffic potential. Participants, according to one regular aviation source who attended the conference, sat up literally pinching themselves to make sure they were not dreaming this up, as Dr. Naikuni elaborated on the competitive threat to African airlines, who, no matter how strong individually or within their alliances, were at the receiving end of Emirates, Qatar Airways, Etihad and more recently of such emerging giants like Turkish, all expanding their destination network across the continent at the expense of the often weak national airlines but even at the expense of the three African giants, minnows though in comparison to what they face as competition in the skies above Africa. AFRAA had in recent years launched a number of initiatives bringing together member airlines to save in joint fuel purchases and through other cooperative measures, but none could have imagined that the CEO of one of sub Sahara’s leading airlines would go as far as suggesting a merger to create a pan African carrier of substance, means and reach able to compete on its own terms with their global opposition. Dr. Naikuni was quoted as having said that unless the current fierce rivals joined hands and more, their individual future would be bleak and survival uncertain, inspite of the ambitious growth plans Ethiopian, South African and Kenya Airways had formulated for themselves. Surprisingly did the CEO of Ethiopian Airlines sing from the same hymnsheet when he supported the concept, confirming that size in aviation did indeed matter and that the idea of a pan African aviation group should be seriously discussed among suitable partners. The discussions following in Johannesburg were spiced up it appears by ET and SAA belonging to rival Star Alliance while KQ of course is a member of SkyTeam but comparisons were swift to be drawn with global developments. Only three major groups remain in Europe, where decades ago single national airlines dominated their home market, mergers in South America were taking the aviation industry into the 21st century and at last there is movement in the Gulf too as Qatar Airways will join One World, Emirates has teamed up – subject still to regulatory approvals – with Qantas and Etihad has started a strategic buying spree with stakes in Air Berlin, Air Lingus, Air Seychelles and notably having talks with Indian airlines about taking a possible stake, maybe in Jet Airways, which would further allow them a foot in the door in one of the world’s most populous countries, now at the threshold of becoming a ‘developed nation’ inspite of the many challenges India still faces. Past experience in Africa is of course far from promising, as Air Afrique’s ascent and decline will attest to. Countries have also entered into bilateral air services agreements with foreign airlines, where in particular Gulf airlines have shrewdly exploited the often hapless negotiators from African countries to secure hugely favourable terms for their own airlines, while in turn other African airlines are kept shut out over competitive fears and political disagreements, something which needs to be overcome on the fast track if even talks of a new sub Saharan mega carrier could begin in earnest. Even though, the combined volumes of the three potential partners, more may of course join the bandwagon if this is to move along and become reality, would still be just about half of Emirates passengers. Interesting enough have rumours emerged from the Gulf of a potential like up between at least two of the leading airlines, and though swiftly dismissed by both of them as a mere fantasy and invention of ‘nosey journalists’ there clearly is more to it than meets the eye, considering the stringent denials by Qatar Airways about joining and alliance as ‘not being the right time’ only to be confirmed two days later. Time to take stock and undoubtedly AFRAA will facilitate further talks and behind the scenes discussions to drive the agenda for African aviation forward. With the unthinkable now said and standing in the proverbial room, the floodgates have opened to brainstorm and to start developing a strategy for an airline, which could take Africa truly to the next level and merge the tag lines of The New Spirit of Africa, Inspiring New Ways into something bigger and better and truly making it The Pride of Africa. As said before, fodder for thought and perhaps an opportunity to take African aviation forward united together instead of being swallowed up one by one divided. Watch this space. 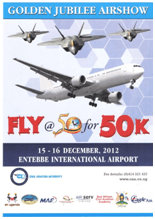 Uganda’s Civil Aviation Authority is partnering to put together a show case aviation event on the weekend of December 15th and 16th, bringing together the aviation industry to give Ugandans a hands on experience. Air Uganda has already offered to fly disabled children on a special flight on their MD 87 aircraft while the general aviation community from Kajjansi, the Kampala Aero Club, MAF aka Mission Aviation Fellowship and Ndege Juu will join hands with their colleagues from Entebbe such as Eagle Air and AirServ. Also on board is the Uganda People’s Defence Forces Air Force and the East African Civil Aviation Academy from Soroti, the latter probably also doing a spot or two of career guidance when talking about the courses available at what is often referred to as the Flying School. Capt. Howard Davenport from the Kampala Aero Club will be performing some of his stunning aerial aerobics displays while other aircraft like air force Sukois and a C130 will be doing fly pasts and low overflights to thrill the crowds, while sky divers will aim to hit the centre point on the ground as they come circling down from the skies above. This is the second such airshow this year after the Kampala Aero Club, on a smaller and invitation only basis, celebrated their 15th anniversary at the Kajjansi airfield, drawing hundreds of spectators to the perimeter fence, but this time it is an open for all event at the Entebbe International Airport, celebrating not just 50 years of Uganda’s Independence but also 50 years of post independence aviation in the Pearl of Africa. December 13th will see Qatar Airways’ first B787 Dreamliner commence flights to London, an occasion the airlines has been using in Uganda to push for added sales in a hardly contested market place. ‘We are the best in the sky and when the new B787 comes on line to London, our passengers to the UK will have the most modern plane to fly with’ said a source from the airline’s Kampala office while also reminding of the range of new destinations QR now offers via Doha, already on line like Perth or coming on line between now and the Spring of next year, such as Warsaw / Poland, Phnom Penh / Cambodia or Chicago in the United States. Local travel agents at least in part agree with QR’s contention to be the best in the sky but continue to compare, either through personal experience or through passenger feedback, the merits of having wide bodied aircraft from Entebbe vis a vis a narrow bodied single aisle aircraft as used by Qatar Airways. ‘There are many of our clients who prefer to fly a wide body like on Emirates for instance. Some are outright reluctant to fly via Addis when they hear they have to use a turboprop aircraft between Entebbe and Addis. Price of course is always an issue but Qatar are offering regular promotions of which travelers can take advantage. But others are not sitting still. Brussels Airlines has launched a new cabin product but they only fly 3 times a week and Emirates comes every day with an A330 and connect passengers to London with an A380 even. Now that is what sells besides the price, to fly on the largest aircraft in the world. QR is trying to sell them the experience of the most modern aircraft in the world when flying to London. There is a good market for travel in Uganda and in the end it is customer loyalty gained by treating them well. When bags go missing, flights are delayed by bad weather into Europe in winter, how the transit in the connecting airport is organized and all. The one good thing is that QR has promised free internet on board of the B787 and I gather is also launching it for their A320 they fly to Entebbe and that will be a bonus for my clients. They can stay in touch while flying and so many now use smart phones or IPads or tablets. Imagine they post pictures on Facebook or use Twitter from onboard, that is also a good extra promotion for the airline’ said a leading Kampala travel agent when discussing the hype over the new aircraft, putting things in perspective of course that marketing bravado needs backing up by service and consistently good performance across the board. Qatar Airways was the Gulf launch customer for Boeing’s Dreamliner and has a total of 60 of these aircraft on order, to be progressively deployed on key long haul routes alongside the airline’s B777’s and A380’s when the latter will join their fleet from next year onward. Happy landings to the new bird and watch this space. As 2012 is slowly getting ready to hand over to the next year in line a new tagline will take over from the hype of this year, as The Pearl of Africa turned 50 and when the Lonely Planet Guide had named Uganda as their top destination for the year. While measuring the success in terms of numbers and revenues will take a bit longer, until the relevant data have been correlated and published, the country’s tourism industry is nevertheless setting its sights on the future. With over 1.000 bird species found in Uganda, bird watching has brought in growing numbers of hobby ornithologists from around the world but even within has ‘birding’ found new friends. The Big Bird Watching Day is now an annual event, supported by the Uganda Wildlife Authority which grants free access to the park, and this annual bird count a few weeks ago has underscored once again the rich diversity of birds found, not just in parks but across the entire country. Organized by Nature Uganda and supported by the conservation and tourism fraternities, the event has now been transformed into naming Uganda being named a preferred bird watching destination, an accolade which will undoubtedly raise even more interest from abroad to come here and explore for instance Bwindi Forest, which the Africa Bird Club earlier this year declared the Number One birding site in Africa or in Queen Elizabeth National Park, home to over 600 bird species alone. Nature Uganda and Birdlife International have mapped out 34 sites across Uganda as important bird watching areas, some inside but many outside the country’s protected areas which makes access possible without any park fees, though such payments of course go to the good use of maintaining park infrastructure. The Uganda Tourist Board will make bird watching a major promotional activity for 2013 to highlight the country’s rich natural resources beyond being just known as the world’s biggest primate destination or for the adventure tourism attractions Uganda now has to offer. More details on birdwatching across Uganda can be found via the Uganda Tourist Board’s website on www.visituganda.com or on the Uganda Wildlife Authority’s site www.ugandawildlife.org but also from Nature Uganda via www.natureuganda.org. When yesterday late afternoon some of the ferries used to connect Mombasa island with the Southern mainland ‘stalled’, stranding tens of thousands of commuters and hundreds of vehicles including tourist busses, suspicion was raised promptly that disgruntled ferry workers, repeatedly on strike and go slow in recent months, had found a new way to demand for their outstanding payments. According to reports received from regular tourism sources in Mombasa at least three ferries were out of service, leaving travelers stuck on either side of the channel for hours into the night, while a single ferry did trip after trip trying to clear the backlog of vehicles and walk on passengers. Another ferry brought from the maintenance yard also stalled before it carried out even one commercial trip, lending more credibility to suggestions that sabotage was at work, even though some sources in Mombasa claimed in communications that poor maintenance was to blame, together with over use of the handful of ferries operated by Kenya Ferry Services. Resorts and the South coast made arrangements for clients coming in way beyond normal dinner time to still get a meal, alerted by safari operators after the drivers had used their mobile phones to call in and report the renewed problems at the ferry ramps. At least two regular contributors from Mombasa laid the blame squarely on the management of the company, calling them incompetent with one saying: ‘It can happen that one or two ferries stall but this is too much. First three of them fail and then one brought from maintenance also fails? There is something seriously wrong at KFS and I am worried that one day negligence may result in an accident. If ferries stall midstream they can collide with ships coming or leaving and imagine the consequences. There is talk of sabotage but if that is true, are those staff even thinking of the risks they expose ferry users? The sooner we get the new road to the South coast the better because at the rate we are going this will cause us more and more problems’. By late evening the jams on both sides had started to reduce but queues were reported to be substantially longer still compared to normal operations at this time of the night. Watch this space for updates as and when available. Starting in early 2013 will Nairobi’s city centre and key traffic hotspots outside the CBD be covered by CCTV surveillance cameras, aimed to improve security for city residents and visitors alike. Over 50 locations have been selected and the installation, due to start in February next year, will cost in excess of 400 million Kenya Shillings, according to a source who attended the formal project launch on Monday at the Kenyatta International Conference Centre in Nairobi. The source, a periodic contributor from the Kenyan tourism industry, used the opportunity to say in a mail: ‘It is a good initiative for monitoring traffic. I am not so sure about the immediate impact on crime but at least when something happens in view of the cameras perhaps criminals can be identified and response can be faster. We would still advise our visitors to use licenses cabs from the hotels where they stay and avoid walking between dusk and dawn. Even during the day caution is advised when walking in the city because of pick pockets and even muggings. The situation is better now but one just should be careful. And it would be good to also extend this system to Mombasa and other urban centres in the country to improve surveillance, especially ahead of our elections next year’. That said, and keeping Kampala’s experience in mind, where out of service cameras have in the past blinded the ‘eyes in the skies’ in the central control room, it can only be hoped that regular maintenance and sufficient staffing will be assured to make this project a success. Part of the official programme for the upcoming East African Community Head of State Summit in Nairobi will be the formal launch of the new highway, which is linking Nairobi, via Namanga, to Arusha. The project which started back in 2004 brings both hope for closer integration of the two countries it connects, and the region overall, but also serves as a stark reminder of outstanding issues between Kenya and Tanzania. closed her borders with Kenya for 7 years] worked very well. We are now looking at establishing a common currency, implementing the remaining protocols so there is no more space for restrictive NTB’s. When they open this new highway, let Kikwete and Kibaki [The Presidents of Tanzania and Kenya] also remember these issues. When Kikwete was here a few weeks ago he evaded the questions but he better be ready to answer them soon and we get a working solution’. While these sentiments are understood only too well, after all Uganda’s general aviation sector is facing similar obstacles when trying to get clearances to fly into Tanzania and is generally prohibited to fly beyond any of the designated entry points like Mwanza or Kilimanjaro, it is unlikely that these issues will be resolved, considering that even a long in principle agreed upon common East African Tourist Visa has been stalled by bureaucrats trying to protect their little fiefdoms to the detriment of what is arguably East Africa’s most vibrant economic sector – Tourism. Watch this space. Kenya’s embattled tourism minister, at odds with the private sector and at loggerheads with the board of directors of the Kenya Tourism Board and its Chief Executive Muriithi Ndegwa, has according to reports received overnight signaled his intention to stand for the post of Senator in his home area of Taita Taveta. He was last weekend seen starting his campaign with his political godfather in tow, a move termed by some observers as aimed to intimidate other aspirants, first within the ODM political party from where he needs to win nomination and then against aspirants from other parties. Mwazo was gifted the tourism ministry after his globally and nationally respected predecessor Najib Balala was fired by his party leader for candidly reminding him of the rules of democracy, and while Balala remained a member of parliament for Mombasa he too appears to be vying for a different position come the next general elections under a new party he helped to form. ‘That announcement signals the end of the minister’s effectiveness in tourism and it is for the better’ quipped a regular Nairobi based contributor before continuing ‘The sector has repeatedly now called for him to be sacked or to resign over the mischief he created in the KTB and how he treated our sector. It is clear he is now seeking a way out of this by attempting to capture another political office, but as far as we are concerned he is already gone. He still sits in his Utalii House office but for us, he no longer exists. We only hope to get a competent man or woman like we had in Balala, because he was a champion for the tourism industry like we never had before. We hope whoever forms the next government will keep that in mind and gives this sector a person who can work with us to better Kenya’s future’. Other sources in unison welcomed the news too, saying it was good for the sector as Mwazo was now sure not to come back to the portfolio where during the past six months he managed to thoroughly upset relations with the private sector and key stakeholders over his abrasive and often misspoken announcements and public utterances. Watch this space as the countdown to the March 04 elections in Kenya is now getting into gear. Kenya’s Communications Commission has earlier in the week lowered call termination rates from KShs 2.21 to KShs 1.44, the second major reduction since originally halving these rates in 2010 from the initial KShs 4.42. Consumers and in particular phone users in Kenya will now be watching keenly, if this will result in lower call tariffs or if the telecoms companies, already bloodied by an aggressive pricing war, will quietly agree to ‘absorb’ the savings and pocket the difference instead of passing it on to their customers, in full or in part. An earlier attempt this year resulted in a presidential directive to halt the process, leading to protests from two of Kenya’s licensed mobile operators which saw this as a move to protect both market leader and the former state owned and now partly privatized rivals. ‘This is good news for sure as the cost of calling can now be reduced. We have a lot of overseas visitors asking on arrival to buy a local sim card to make cheaper calls while in Kenya on safari or at the beach. Using their home operators by roaming is very expensive for them, But really what the main issue today is in Kenya is the cost of surfing the internet. Now that we have a huge capacity by fibre optic cable the operators complain it is not being used, but that is because they are expensive. They should half their tariffs or more and a lot more Kenyans and visitors would subscribe. Even the price of the modems is expensive by the way. Maybe this is the next thing CCK should look into after cutting those rates for calls between operators by a third’ said a regular contributor from Nairobi’s tourism fraternity. Call termination cost are a major issue across the region as in Uganda too communications companies are lobbying the UCK to bring those crucial rates down to level the playing field vis a vis market leader MTN, which is using the higher than necessary prescribed tariffs between networks to fend off competitors with significantly lower market share. At the same time are mobile operators across the region now increasingly under scrutiny over dropped calls and call quality and it is expected that the regional regulators will roll out a combined campaign next year to fine telecoms companies which do not meet benchmarks or exceed a certain number of direct complaints by subscribers. The Eco Warrior Awards in Kenya were founded to recognize efforts, innovations and exceptional achievements for promoting responsible tourism and enhancing tourism sustainability which directly conserves the natural environment linked to local communities through mutual beneficial and equitable partnerships. Nature conservation through community development by tourism is the essence of eco-tourism. Having previously been awarded ‘The Most Responsible Tour Operator 2010′, Gamewatchers Safaris were delighted to be recognized for their work alongside the Maasai community winning ‘Community Conservancy of the Year 2012‘ for the Ol Kinyei Conservancy in the greater Mara ecosystem. Set on 17,500+ acres of land, Ol Kinyei belongs to a Maasai community who set aside the land for the purposes of wildlife conservation. Ol Kinyei Conservancy is home to only one camp, the Porini Mara Camp which accommodates a maximum of only 12 guests at any given time – making this not only an exclusive experience but one that respects the principles of eco-tourism. Located within the Serengeti-Mara eco-system, Ol Kinyei is renowned for its unspoilt and breathtaking scenery with diverse terrain offering on one hand open savannah plains and rolling hills on the other. The land, with its abundance of water sources in the form of springs, streams and rivers, coupled with spectacular views across the Mara plains, is home to a wide variety of animal species. There is a resident lion pride of over 20 animals and several leopards also have their territories within the conservancy and are often sighted by guests from Porini Mara Camp on evening or early morning drives. Cheetahs are frequently seen and it is not rare to come across large numbers of giraffe as well as Cape buffalo and elephants. The wildebeest migration also passes through Ol Kinyei when herds from the eastern plains of Loita join the migration to the Mara Reserve. The local Maasai make first class guides and are on hand to share their experience on what do see and do. Another feather in their cap for the Porini Camps in 2012 was when Porini Mara Camp was awarded a ‘Travelers Choice Award 2012’ by Trip Advisor for being ranked the number one property in the Masai Mara National Reserve with 176 ‘Excellent‘ reviews. Further information about the camp including suggested itineraries, safari holiday packages and booking details can be found here. Congrats once again to the entire team at Gamewatchers and Porini Camps. Years of planning and construction came to a successful conclusion yesterday when President Kikwete, accompanied by Kenya’s President Kibaki and Burundian President Nkurunziza officially launched the new headquarters of the East African Community in Arusha / Tanzania, which were funded entirely by the German government at a cost of nearly 19 million Euros. The offices of the EAC were since the restart of the community housed, on a rented basis, at the Arusha International Conference Centre but it is understood that all staff have now moved to the new building. EAC Secretary General Dr. Richard Sezibera on the occasion also signed new financing and support agreements with Germany and USAID towards improved tax administration, investment promotion and linking the 5 tax and customs bodies across the East African region though digital integration. Notably absent on the occasion were the Ugandan and Rwandan presidents Yoweri Museveni and Paul Kagame, reportedly still dealing with the Congo issues back home but expected to meet their colleagues in Nairobi this weekend for the upcoming annual Head of State Summit. The African Aviation Tribune has earlier this week published what appears to be FastJet’s planned schedule for the region, covering Entebbe, Nairobi and Zanzibar. The self pronounced low cost carrier, set to commence flight operations later this week, plans according to the AAT website to fly up to four times a day from Dar es Salaam to Nairobi, once a day to Entebbe and 6 times a week to Zanzibar. Earlier suggestions, that the airline would try to muscle in to the market for bus passengers instead of vying for the limited point to point traffic, have been put to rest however, as bus companies surveyed reported no significant reduction of prebookings for their overland busses from Dar es Salaam to Nairobi, very likely as a result of the true cost of travel with FastJet now becoming apparent, that sales have started. On the Nairobi route, whenever flights to the Kenyan capital will commence – no date has been given yet – FastJet will face competition from Kenya Airways and their Tanzanian partner airline Precision Air, while Air Tanzania is reportedly moving heaven and earth to return to that route ahead of FastJet, with the Tanzanian government continuing to financially support and back ATCL. What will be intriguing is the head on competition between FastJet and Air Uganda, which is also flying daily to Dar es Salaam from Entebbe using a smaller CRJ 200, and plenty of questions are in the air in Kampala’s aviation circles over the fact that Fastjet’s Regional General Manager Kyle Haywood was until a few weeks ago CEO of U7 and has now turned against his erstwhile employers in an opposing role, fully privy to the market strategies of Uganda’s quasi national carrier. Fodder for thought and something which will be watched with eagle’s eyes no doubt. When shock news broke a few weeks ago over the seizure of a record haul of blood ivory in Hong Kong, and fingers were pointed immediately at Tanzania, the first reaction from Dar es Salaam was one of denial and feigned outrage. This however soon gave way to a more sober assessment as international arrest warrants were issued by Hong Kong authorities for at least 3 Tanzanians suspected to have been closely connected with the seized shipment. A more recent seizure by Hong Kong customs officials then had Tanzania’s tourism Minister Amb. Khamis Kagesheki come out with guns blazing, promising action and apparently kicking off a series of police searches, leading to the arrest of some prominent Tanzanians who appeared in court late last week. One Hassan Othman, currently chairman of Tanzania’s Coast Regional Football Association, together with at least four others, appeared in court charged with a number of offences related to the seizure of the blood ivory in Hong Kong as well as for possessing and handling ivory. With investigations still ongoing, the case was postponed until tomorrow, Wednesday for another mention though the accused were not required to take a plea, as the case was likely to be moved to a higher court due to the gravity of the offenses of economic sabotage. Many observers have attributed the arrests and ongoing crackdown on poachers, which led to several seizures of elephant tusks and other trophies in recent weeks, to Kagesheki’s determined stand against poaching, which has the apparent backing of Tanzania’s powers that be – a complete U-turn from the agenda of his sacked predecessor under whose reign poaching literally took root like a wildfire, costing at least 30 elephant their lives each day. Said a regular source from Dar es Salaam while discussing these latest developments: ‘I begin to see why you are in favour of Kagesheki. The man seems to be exactly the no nonsense man you describe him to be and means business. I guess his first reaction when the big shipment was confiscated in Hong Kong was a result of bad information by his officials but I guess they will be paying for that. Now, I think he understands how serious poaching has become and how bad it is for us in Tanzania. I like the economic sabotage charges, because that is what poaching is. I think if anyone can turn this around it should be Kagesheki because he also has a lot of respect in cabinet where he can rally support of other ministers in charge of police and other security organs’. It could not be established though if the international arrest warrants from Hong Kong were for those now in court in Dar es Salaam, and if extradition would be considered, should indeed they be the suspects sought by the Hong Kong Chinese authorities. Watch this space. One of the world’s leading guide publications, Globe Spot, has named Rwanda as their top 6th global destination, the highest scoring African country in their top 10 being Mozambique in second place and Malawi in ninth position. This recognition will likely increase the spotlight on Rwanda and one of East Africa’s foremost adventure destinations as the diversification of the tourism products has now taken firm root. Once known almost exclusively for gorilla tracking, the country now has widened the scope and offers spectacular bird watching, East Africa’s sole canopy walk deep inside Nyungwe Forest National Park, the Akagera savannah national park and scenic hikes and cycling trails along the shores of Lake Kivu from Cyangugu via Kibuye to Gisenyi. That 227 km long Congo Nile Trail traverses and passes forest, takes hikers into the hills above the lake and through tea and coffee country in what has been described as Africa’s safest way to explore rural Africa and encounter the rich culture and history of Rwanda on foot or by bike. Tourism has recorded once again an increase this year over 2012 and when the books close this year it is anticipated that growth in arrivals will stand at over 20 percent compared with 2011 and a corresponding rise in earnings, which would put the tourism industry once again on top of the economic performance list. Notably has the Rwanda Development Board’s Tourism and Conservation Department launched a special promotion in conjunction with RwandAir and the Nyungwe Forest Lodge, offering a 2 night three day trip, where visitors can fly on RwandAir’s Dash 8 aircraft from Kigali to Cyangugu / Kamembe and then stay at the fabulous 5 star Nyungwe Forest Lodge, meals and transfers included plus of course a visit to the ‘Enchanted Forest’ as I have named Nyungwe in several feature articles. All this is available through RDB’s Kigali office at a cost of only US Dollars 459 per person. This package is valid with immediate effect and will run until 31st January 2013, subject to terms and conditions and subject of course to space available at a preferred date. ‘They are woefully unprepared to even reach applicant status at this time and their budget woes have not helped them at all. But I think the last nail in their coffin was how they have caused huge financial pains to the business communities in Kenya and Uganda by not paying bills and this is the result now’ said a regular source close to Uganda’s foreign ministry yesterday, when discussing the report of a panel of experts, which was tasked to assess South Sudan’s preparedness to join the East African Community, before continuing: ‘Your report about Jetlink in Kenya goes to the heart of the issue. We appreciate South Sudan has a lot of issues, a lot of problems and most of those are caused by external factors, but the EAC is about integration, about harmonized trade, financial, legislative and regulatory regimes. South Sudan has on a broad basis missed the benchmarks. In East Africa we need to have a free trade in currency for instance, that is not there. They now had 6 years since the CPA and knew they had to start harmonizing laws and all but maybe their focus was elsewhere. Politically we want South Sudan to become a member but they have to be ready. Remember the long ascension path for Rwanda and Burundi. So even if in a year the experts might give thumbs up the timeframe for readiness will be much longer. South Sudan needs fundamental economic reforms first, financial reforms, the laws in place to protect investments, clarify on so many issues. This is the sad truth but we will continue to help our brothers and sisters there to eventually reach that goal’. The untimely news for Juba have become public a week before the annual head of state summit of the EAC is taking place in Nairobi / Kenya, one of the countries hardest hit by South Sudan’s inability or unwillingness to pay for goods and services supplied, a situation which has caused private Kenyan airline Jetlink to halt operations as over 2 million US Dollars of unremitted funds are stuck in Juba’s banks while a range of other leading business names have also halted trading with South Sudan unless strictly paid upfront in cash. The decision last week to reschedule the start of oil production, as a result of ongoing serious differences between Juba and Khartoum, has by the look of it worsened the situation, just as hope for resumed cash flow was rekindled, only to be doused when Juba announced that no oil would flow for the time being until political and security issues between the two countries have been resolved. It is understood that Juba will send an observer mission to the EAC Summit in Nairobi, as will incidentally Somalia, a country also interested to join the East African Community as and when internal peace has been fully restored and formal trade has taken roots again. Watch this space. Information is emerging from Brazzaville that an Iljushin 76 cargo plane, owned by Aero Services, while attempting to land at Brazzaville’s international airport, crashed short of the runway into a housing estate, killing the crew on board and scores of people on the ground as the plane hit, disintegrated and the wreckage caught fire. The registration of the plane was provisionally given as EK76300 but details when it first entered service were not immediately available nor the number of crew on board though reports from Brazzaville speak of over 30 bodies recovered from the crash site so far. Weather conditions were poor at the time of landing and may have played a major role in the crash, similar to when a B727 of Hewa Bora crashed in Kisangani last year. Information was received that the planned additional flights between Addis Ababa and Hong Kong, due to start earlier this week, have been pushed to now commence on December 14th. From the present 4 flights a week, routing from Addis via Bangkok to Hong Kong, the destination will be served daily using a B767 aircraft. This will also push the number of weekly flights to Bangkok to overall 10. No specific reasons could be obtained why the start of the extra flights was postponed from the 24th November to the mid December date although there has been some speculation that aircraft availability may have played a role, as the Ethiopian flag carrier awaits further deliveries of their latest ‘bird’, the B787 Dreamliner, which will then allow the re-allocation of their B767’s to other routes or increases in frequencies as is the case here. Ethiopian Airlines has reportedly expressed their interest to make a bid for Air Malawi, which according to a periodic aviation source in Johannesburg has been put back on the market by their government, which plans to sell up to 49 percent to a strategic investor. A number of other airlines have expressed interest already in putting in an offer, but Ethiopian, a continental aviation giant, could be a preferred choice for Malawi for their expertise and track record in Africa. Ethiopian already has a significant shareholding and management rights in West African airline ASKY which is based in Lome / Togo and serves a number of destinations, feeding and de-feeding into Ethiopian Airlines flights to Addis Ababa and beyond. Should ET’s bid for Air Malawi be accepted ASKY could serve as a model of how best to develop the airline into a regional carrier using Lilongwe and Blantrye as their home bases. The bid could also set a new trend for Ethiopian to grow further on the continent through such strategic partnerships and it will be interesting to see what other such opportunities the Ethiopian national airline might jump on should countries with a history of financially troubled national airlines opt for privatization. It also remains to be seen how other African aviation heavyweights like Kenya Airways, South African and Egypt Air – the latter two incidentally Star Alliance partners of Ethiopian Airlines – will react to such a new strategy, so watch this space for future news. Starting tomorrow, 02nd December, Emirates will move from presently 11 flights per week between Dubai and Mauritius to 14, making it a double daily affair with the island in time for the forthcoming high season when the holidays start, using a B777 for the extra flights. Mauritius’s hospitality industry has for long been advocating to grant international airlines greater access to the island to add occupancy to new and existing resort rooms, and the prospect of losing the Indian Ocean’s number one position as far as tourism arrivals will go in 2012, to the Maldives no less, seems to have prompted some action towards that end. ‘We can only hope that this will give Mauritius the groove back. Daily flights by Emirates are a big thing. They will promote strongly in what we feel is new and emerging markets, markets with high growth potential like China and Russia and even India. Travellers can now connect from anywhere in the world to Mauritius without much waiting in Dubai because there are now two flights to Port Louis. My colleagues and I think this is one of the most significant positive steps forward tourism has seen for the entire year. It will pay off big time because now Emirates is the largest foreign carrier coming to Mauritius and we can build on that relationship’ said a regular source from Port Louis after confirming that the schedule changes will take effect tomorrow. Will Mauritius make that long awaited comeback as leader of the pack among the Indian Ocean islands in 2013? Time will tell so watch this space. Only days after confirming that Shanghai will be served nonstop and no longer via Kuala Lumpur from next year onwards, did news emerge that Hong Kong will get a third weekly flight effective 02nd July next year. Mauritius tourism sector has warmly welcomed the news as it will add extra seats on routes into China which is seen as an emerging growth market, able to take up the slack of a weaker than expected performance by traditional markets for Mauritius in Europe. The island’s private sector, for long at odds with the Mauritius Tourism Promotion Authority over the failure to more effectively market the island in new and emerging markets has described 2012 as a year of lower than expected occupancies as the Maldives are for the first time ever overtaking Mauritius as the number one destination among the Indian Ocean islands, with number three placed Sri Lanka also closing the gap. The ongoing restructuring at Air Mauritius, in particular since the announcement in September that Andre Viljoen was made substantive Chief Executive after almost two years on the job in an Acting capacity, has taken a firm hold by the look of it and the often critical hospitality industry on the island, after the withdrawal and then part re-entry in the Australian market, seem more inclined now to throw their weight behind the national airline again and has toned down demands for foreign carriers to be given added frequencies, for now at least. Watch this space for regular and breaking news from the Indian Ocean aviation scene. The third edition of the Carnival International de Victoria will commence the formal countdown this evening in Bel Ombre / Mahe in the presence of the Minister for Tourism and Culture Alain St. Ange and the CEO of the Seychelles Tourism Board Elsia Grandcourt. Invited guests from the tourism fraternity, government officials, sponsors and the winners of this year’s costume contest will be joined by musicians and dancers, creating a befitting background to the launch ceremony. The 2013 Festival, now also part of the regional Vanilla Island cooperation’s calendar of key events across the Indian Ocean islands, will be co-hosted by the Seychelles with La Reunion, partnering once again like last year, but also Madagascar and notably Zimbabwe. The arguably most important festival now on the Seychelles has since its launch edition in 2011 become the focus of global interest and a cornerstone part of the Seychelles marketing juggernaut, which seems to grow in strength and magnitude year after year. The Carnaval de Carnivals as it is also known, draws in participants from the biggest global carnival nations and will next year feature participants from Brazil, the Notting Hill Carnival in the UK, from Germany and a range of other countries. Participants will operate floats and display Carnival Art at its best, when the parade begins to move through the centre of the Seychelles capital of Victoria on Sunday the 10th of February next year when the three festival days will reach the climax. Time to book, not to be missed as Seychelles, Another World awaits your visit. Several leading tourism stakeholders have over the past days written, questioning the real intent by sections of the Seychelles media to front page, ahead and during one of the archipelago’s main tourism events, Subios – the Festival of the Sea of allegedly having pirates off Bird Island or publishing crime statistics. While in agreement over the role of the media and the freedom of the press as enshrined in the Seychelles Constitution, there was clear exasperation among the individuals who felt it necessary to share their concerns, suggesting ulterior motives and one going as far as accusing the publication in question of attempting to sabotage the positive publicity SUBIOS was otherwise generating for the country. ‘I think we in Seychelles are doing more than most others in the fight against what you call ocean terrorists. We call them pirates but I think we can agree on both definitions. Suggesting that pirates are threatening our sovereign waters again and mentioning in the same article Bird Island, can have a profound effect on tourism arrivals and being seen as a safe destination. It was for sure insensitive to put this on the front page as visitors started to stream to Seychelles for the Festival of the Sea, and at worst calculated to cause our sector damage. The Seychelles government operates flights around the clock, supported by UAV’s, to monitor our sea lanes and our coast guard is on full alert at all times. We got more ships out than ever before and work hand in hand with our partners and friends. What will a cruise line executive think when he gets such headlines on his desk, and from within the Seychelles. Will he bring his cruise ship or wait another year before he decides to let his ship come to Victoria? And it is the same with the crime statistics. We know we have work to do and our association is meeting with government and police officials all the time about it. I am not saying that some of the statistics are not true, but to splash them as a headline as SUBIOS is reaching its climax? Again, I question the timing and the true intent behind it. You have been here many times, you have travelled across the islands, used busses and public transport. You explored the budget market with guest houses and B&B’s outside the main resorts, did you encounter insecurity? I think it is bad to play politics with such issues and risking the goose which lays our golden eggs. Please put this right because I know how many agree with me and how many read your articles’. And true enough has the naval coalition of late spoken of a significant reduction of pirate activities now that the safe havens of the pirates along the Somalia coast are progressively being captured by UNISOM forces, with the fall last month of Kismayu being the greatest victory so far to keep pirates from leaving shore to hunt for ships on the open sea. While the change of weather would in past years have encouraged more attacks, the coalition naval forces are confident that this year the pirate activity will be much curtailed and reduce further, as the new government in Mogadishu is restoring law and order and controlling more and more of the country again. A source based in Nairobi and close to the ‘action’ said on condition of anonymity for not being an official spokesperson: ‘The weather is now calming down and our vigilance will remain high. The success on land to capture ports and harbours in the past used by pirates is a big help already but those who still sail from parts of Somalia not yet fully under government control, those our patrols on the surface and from the air will deal with. Peace is returning to Somalia now and this menace will be dealt with by land based security forces very soon’. With better prospects, and while vigilance and continued surveillance and monitoring will be absolutely necessary, there should be definitely less concern about pirates operating in Seychelles waters or reaching anywhere near the main islands, contrary to what has been suggested. Time then to go and visit the Seychelles, truly Another World. !! 40 Years of newsletters digitally available !! All newsletters from 1971 till now are digitally available. They are scanned as “Searchable PDF” files, so it will be easy within a file to find just a bird or a special meeting. The disadvantage is that the total filesize is 5 Gigabyte. If you are interested to download these files, please send me your email address. They will be made available via a Dropbox folder, which you can access via the web browser. It will be done in four parts (1970-1980, 1980-1990, 1990-2000, 2000-2012). Over the years of writing the Weekly I have not done much on the north of Zambia. The reason for this is that I have never visited the area and know little about it. I realise that this is a serious omission and hope to make up for it soon. As we know from the Zambia Government, they are keen to promote tourism in the north of Zambia. There are two problems with this. Firstly if tourism cannot work around Livingstone, which it doesn’t, it does not stand much chance of flourishing in the north. Secondly, the infrastructure, like roads, is not good. Anyway, eventually, if the government does try to help the tourism industry, there is lots to see in the north. I have drawn a map to show the Ramsar Sites and the Important Bird Areas. 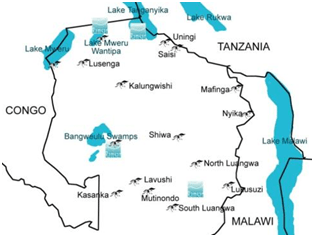 There are four Ramsar Sites in the north – Lake Tanganyika, Lake Mweru Wantipa, Luangwa Floodplains and Bangweulu Swamps. Ramsar Sites are Wetlands of International Importance. They are important not only for the people who live around them but they are important environmentally. If the wetlands are used wisely there will be enough for the people and enough for the wildlife that depends upon them. Governments around the world sign the Ramsar Convention agreeing to maintain the sites for the benefit of people and the environment. Often linked to Ramsar Sites are Important Bird Areas (IBAs). These sites are identified by Birdlife International and are found all over the world. There are 42 IBAs in Zambia with 16 of them in the north. IBAs are linked to Ramsar Sites because birds are dependent on water – some of the birds are dependent because the water is in their home range, but more importantly many birds migrate to and from Europe to Africa every year. The birds have to know where they can stop en route to drink. If a water source dries up or is polluted, the birds will not survive their long journeys. Bangweulu Swamps. 28/08/91; Northern Province; 1,100,000 ha; 11°25’S 029°59’E. Includes National Parks, Game Management Areas. In addition to providing a breeding ground for birds, fishes and wildlife (e.g., the African elephant Loxodonta africaca, the buffalo Syncerus caffer, and Sitatunga Tragelaphus spekei), the site is known to support large numbers of the endemic, semi-aquatic Black Lechwe (vulnerable Kobus leche) and is home to the threatened Wattled crane (Grus carunculatus), as well as the only home in Zambia for the threatened Shoebill (Balaeniceps rex). The swamp is a natural flood controller and important for groundwater recharge and water quality control. The site contains the historical Nachikufu caves with bushman paintings, maintained by the National Heritage Conservation Commission. Threats to the wetland such as poaching will be addressed by the National Wetlands Steering Committee with a proposed general management plan that will steer development away from sensitive habitats. The Zambian Wildlife Authority in collaboration with WWF-Zambia office are collaborating on improving sustainable livelihoods and ecotourism possibilities. The site was extended from 250,000 to 1,100,000 ha on 2 February 2007. Ramsar site no. 531. Next year David Livingstone will have a birthday – number 200. He has of course died – he died in 1873 in Chisambo, Northern Zambia. It is, though, a nice idea to celebrate his birthday even though he won’t be around to enjoy it. Scotland’s National Museum in Edinburgh has opened an exhibition in his honour. It includes Livingstone stories and memorabilia from his birth near Glasgow, to his work in a mill, his medical training and his work as a missionary in Africa. Both Malawi and Zambia will be celebrating David Livingstone’s special birthday with functions and exhibitions. HOWZIT, my China? That’s the new catchphrase across much of southern Africa as a new scramble for resources gathers pace. And the scramble – and the rampant destruction of the environment – is nowhere more evident than in Zambia. It smacks you in the face as you leave the little border town of Sesheke, across the Zambezi from Katima Mulilo. What was a rough bush track two years ago is now a broad highway, not yet fully tarred, but with long stretches of brand new tarmac between the indiscriminate grading that is taking place. Indiscriminate is the word. The Chinese road builders have taken the straightest line they can, just above the Zambezi’s high water flood mark, and have bulldozed great swathes of miombo and mopani woodland. The road has cut villages in half. Hectares of bush have simply been smashed aside and the earth ripped asunder to create huge borrow pits where the road builders have removed rock and gravel to use as foundations and infill for the highway. It must all be horribly visible via satellite on Google Earth. Sitting on a deck in an idyllic setting under a huge pod mahogany on the banks of the Zambezi, we are told of how, since the road camps have moved in, the wildlife has disappeared. Our host tells us that “prostitution is rampant here now, and this was an isolated and innocent community just three years ago.” A recent report in the Times of Zambia had it that 90 percent of recent poaching incidents took place within a 10km radius of Chinese road camps. But everyone agrees that Africa will win – the road builders have put huge causeways across what are now dry tributaries of the Zambezi, with just a few small, relatively puny culverts to cope with the annual floods. “This road will wash away with the first rains, and that’s what everyone’s praying for,” our host says. The road is a massive scar, running all the way from Sesheke, up the west bank of the Zambezi past the Ngonye Falls, and will soon link Senanga and Mongu in Barotseland with the Copperbelt. The plan is to link towns like Ndola, Mufulira and Kitwe with Katima Mulilo and the Caprivi Highway, and then down to Walvis Bay, so that the new Chinese owners of some of the big mines can export the ore through Namibia. It is the end of one of Africa’s great wilderness areas. By this time next year, if the road survives the rains, 40 to 50 ton trucks laden with smelted copper will be thundering through Barotseland, down the Zambezi and through the Caprivi. But it doesn’t end there. For some bizarre reason, the Chinese (with the backing of the Zambian government) are determined to complete a project begun 10 years ago to build a 74km tar road from Mongu, across 35km of the Zambezi Flood Plains, to Kalabo, and then to Sikongo on the Angolan border, eventually linking all the way to the Angolan coast. Only one problem: the causeway has washed away almost every year since they started. The Zambezi is a mighty river in flood. When we drove through, it was just three or four weeks before the annual rains began in earnest, the first small rains had already started falling. There was frantic construction going on, Chinese trucks thundering back and forth, and a massive section of the Zambezi Flood Plains had simply been bulldozed and ripped apart. It was heartbreaking. But it is a road to nowhere… until you read Duncan Clarke’s Crude Continent: The Struggle for Africa’s Oil Prize and realise that western Barotseland is thought to have vast oil and gas reserves. I went to the Times of Zambia website and typed the word “Chinese” into their search engine. In just two months of reports, I found the following new Chinese projects: $300 million Pensulo-Kasama power scheme to be constructed (July 22); the Zambia-China Economic Zone, including the Chambishi Copper Smelter established, valued at $820m (July 27); Chinese investor, Henan Guoji Investments, to construct 1 000 houses, a luxury hotel and a mall in Ndola at a cost of $200m (August 2); China CAMC Engineering and Chinese government building the $150m Mbala-Nakonde Road (August 7); Changfa Resources Mokambo Copper Mine to invest $500m near Mufilira (August 30); Sino Metals Leaching invest $67m (September 2); and China Non-Ferrous Metals Mining Corporation announces $400m investment on top of an existing investment of $1billion (September 27). These guys make Cecil John Rhodes look like a rank amateur!